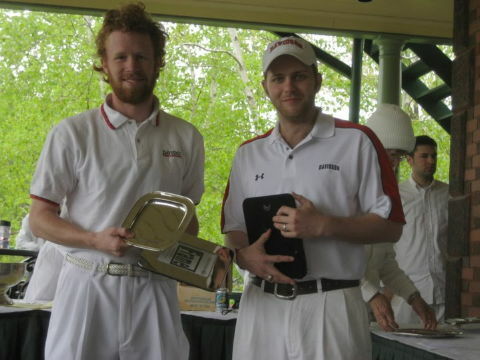 Davidson College juniors Douglas Clark-Brown and David Osborn won the Collegiate Golf Croquet Championship again this year. The tournament was played at Merion Cricket Club in Philadelphia, April 26–27. 14 teams came from Georgetown, St. John’s, VMI, Navy, William and Mary, Davidson, Bard, and SUNY New Paltz. (Several schools entered more than one team.) Playing in the final match against Peter Hatfield and Chris Monahan of William and Mary, the Davidson pair fell behind early but then rallied for a dramatic 7-6 win. David and Douglas are sure to return to Philadelphia next year, though next year they say that they will likely play in the American rules portion of the tournament and leave the golf croquet competition to Douglas’s younger brother, Aubrey Clark-Brown, who will be a freshman at Haverford College this fall (across the river from Merion Cricket Club). See also the report in the Davidson College newspaper.